Thanks to my wonderful supporters, I’m ready to announce the arrival of a new artist’s book. I’ve called it a “Thoughtbook”. It’s full of inspiration. With plenty of empty pages, it invites to draw and to write down thoughts of all kinds. I’ve carefully “curated” fourteen of my favorite works into this book, and two big essays by curators whom I really admire. 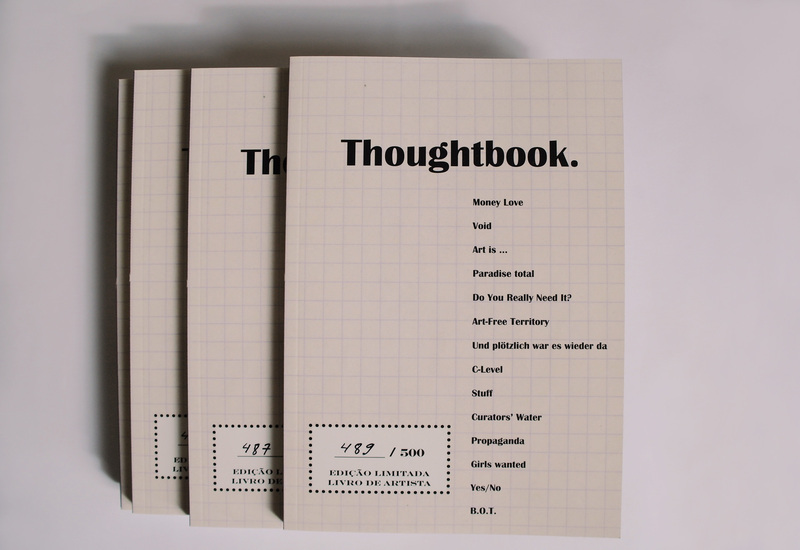 “Thoughtbook” appears in a signed and numbered limited edition of 500. Lena Lapschina: “Thoughtbook”. 168 pages, 14.8 x 21 cm. With essays by Cathérine Hug and Matt Bowman. Includes 14 works by Lena Lapschina: Money Love, Void, Art is …, Paradise total, Do You Really Need It?, Art-Free Territory, Und plötzlich war es wieder da, C-Level, Stuff, Curators’ Water, Propaganda, Girls wanted, Yes/No, Back On Tuesday. This entry was posted in Lena Lapschina­­­­ and tagged artist's book, artists' books, cathérine hug, lena lapschina, matt bowman, thoughtbook on January 6, 2016 by LL.